Wenche Eikeseth grew up hearing about the boxers her grandparents had in the 1920ies, and when she bought her first dog in 1960 it had to be a Boxer. She very soon became a member of the board of the Norwegian Boxer Club and later its Chairman, and was the editor of the club magazine for many years; also the author of the book ”The Boxer in Norway”. She showed boxers for many years. Today she and her husband Øystein, also an authorized boxer judge, have a few boxers. She is an honorary member of the Norwegian Boxer Club. Wenche has been an authorized judged of boxers for 40 years. She is today qualified to judge many other breeds. Besides having judged in all Scandinavian countries, she has also judged in Russia, Indonesia, Australia in many countries in Europe. Wenche has been the Chairman of the Standard Commission of the Norwegian Kennel Club for almost 20 years and secretary of the FCI Show Commission. 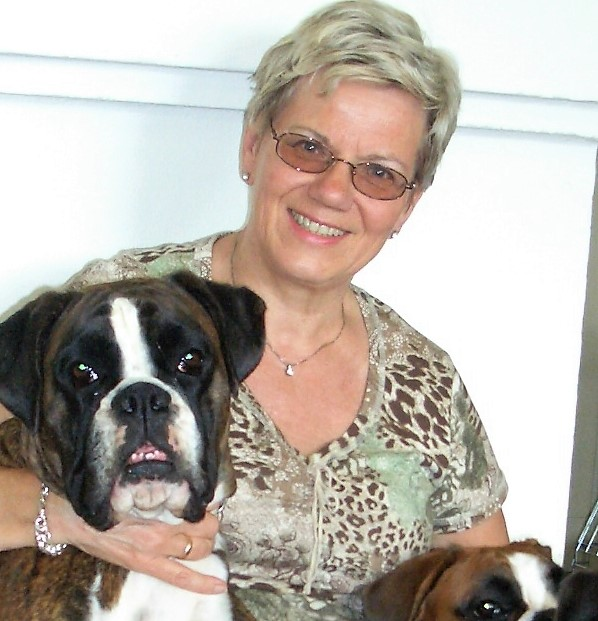 She is a co-author of the textbooks in anatomy used by the Norwegian Kennel Club in education of show judges, and also a popular instructor in courses of dog anatomy held all over Norway. In 2014 Wenche received the honorary needle in gold from the Norwegian Kennel Club.